Commercial Acrylic Dome Skylights- Al-Arch Skylights, Ville Saint Laurent, QC. 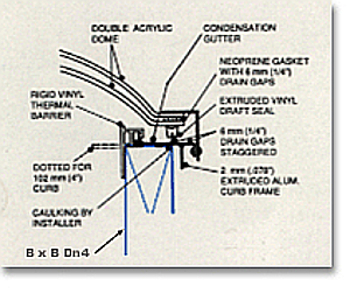 Commercial Acrylic Dome Skylights; (NFFDD) , (DDA), (CADD) and (CLDD). Skylights are factory assembled and designed in Canada by Architecural Plastics Ltd. who have been in operation for nearly 40 years and they expertly maintain a high standard of quality and durability. 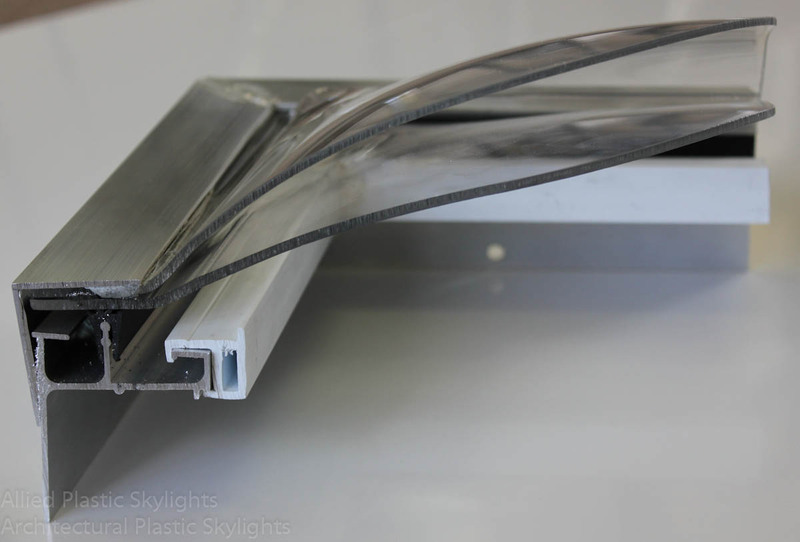 Commercial skylights have 6063-T5 aluminum alloy extruded frames that are mill finished as standard. An optional Duracon® (Thermosetting acrylic) 100 architectural metal finish is available in a wide range of colours. To be shipped to the building site in pre-assembled form where possible. Curb frames may be mounted to wood or concrete curbs constructed by the installers, or with integral metal curbs supplied by our manufacturer. The skylights on this page can be ordered and will be delivered in 10-14 working days. 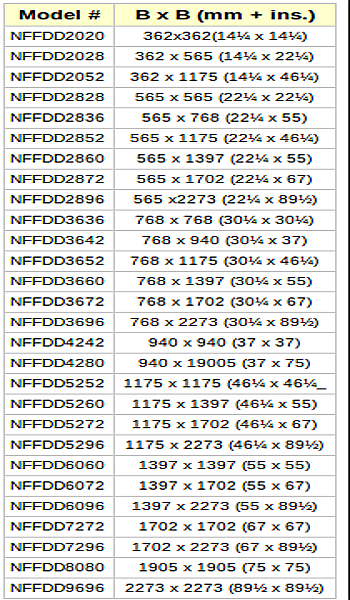 For long linear applications, pls. consult our Continuous Vault Skylights page. Aluminum frame skylights (NFFDD), are acrylic double dome pre-assembled skylights, with clear outer dome (or translucent white or tinted) and a clear inner dome. 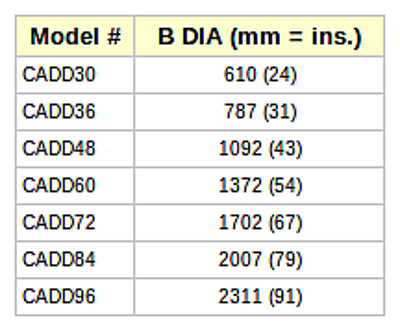 A 6063-T5 aluminum alloy extruded mill finished curb and retaining frame complete the unit. To be installed on a 1 1/2 inch (38 mm) curb by means of wood screws through holes in inner frame. 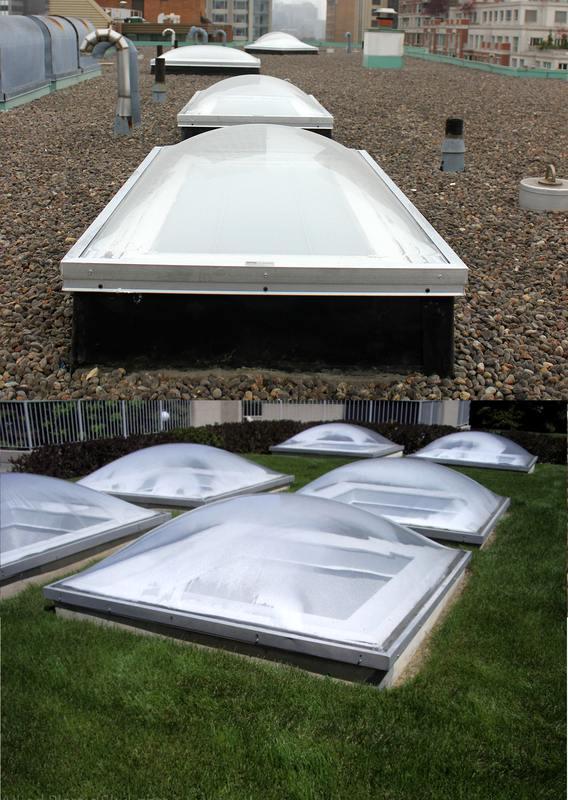 Insulated curb (DDA), acrylic double dome pre-assembled skylights, complete with clear outer dome (or tinted) and a clear or white translucent inner dome. 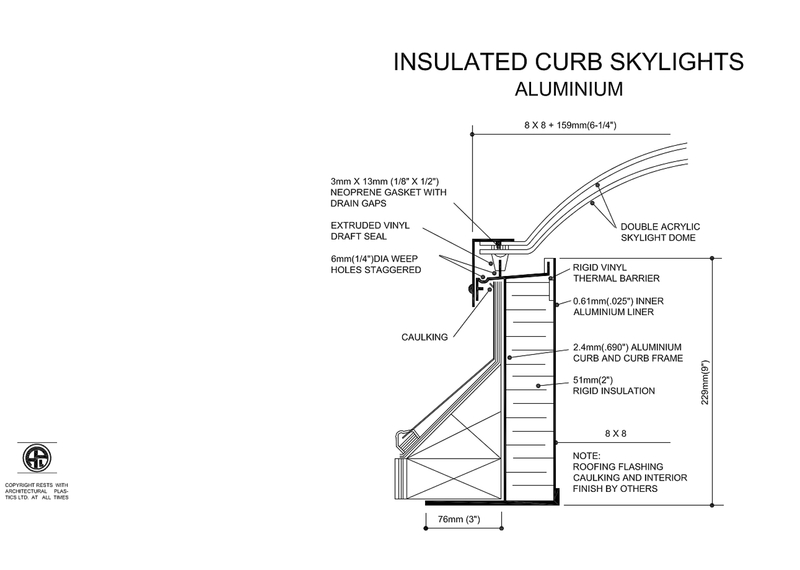 The 6063-T5 extruded aluminum curb is 229mm (9") high and 50mm (2") wide and filled with rigid insulation. 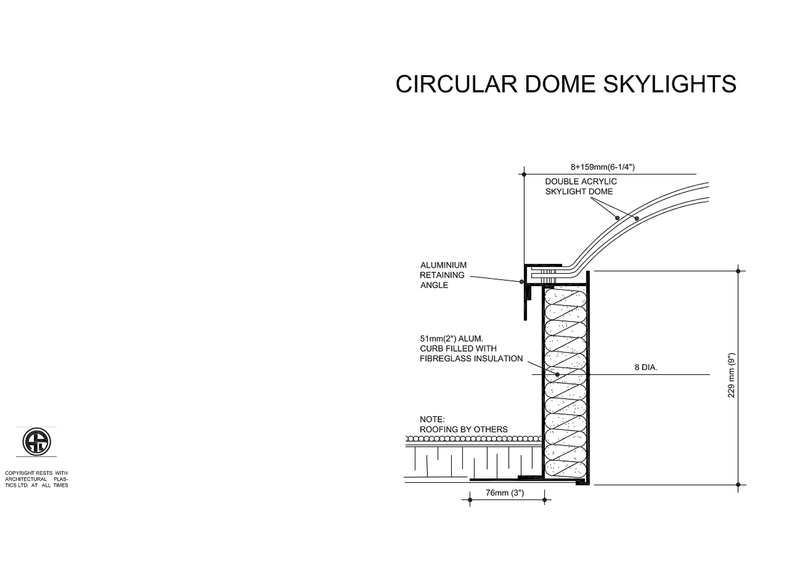 Circular Dome (CADD) pre-assembled skylights have acrylic double domes; a clear outer dome or tinted, and a clear or white translucent inner dome. The frame is a mill finished 6063-T5 extruded aluminum curb of 229mm (9") high and 50mm (2") wide and filled with fibreglass insulation. 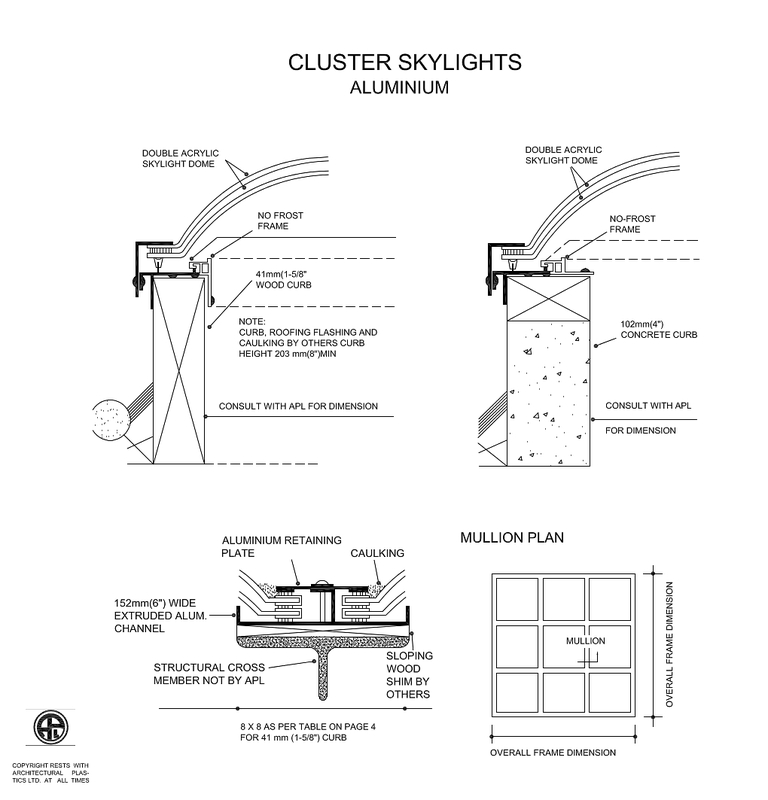 Integral Cluster Skylights (CLDD) are basically a composite of individual single dome, double dome or Continuous Skylights. Choose clear or white (translucent) single acrylic dome, or clear outer dome with clear or white (translucent) inner domes. Domes will fit on a 41mm (1 5/8") by 102mm (4") wide curb. Complete with a 6064-T5 mill finished extruded aluminum alloy No-Frost perimeter curb frame and intermediate retaining frame assemblies. -Commercial acrylic dome skylights are built to withstand all kinds of atmospheric conditions. -Acrylic domes are durable, shatterproof, will not get deformed over time, nor get damaged by the hottest summer sun. Commercial Acrylic dome skylights have a 5 year warranty starting from their date of installation- to be free from material and manufacturing defect.